These stunning Balmoral Dog Sofas in steel grey faux leather come with a Scotts Dove fabric premium fill cushion (medium-hard support). A luxury cushion fill (soft-medium support) is also available at an extra cost. Please select your cushion fill in the menu and choose the size that corresponds with the size of bed you are ordering. For example if you are ordering a medium bed, please choose either a medium premium fill or medium luxury fill cushion. As standard, these dog sofas come without recess buttons. Please select if you would like to add the buttons in the menu and choose the size that corresponds with the size of bed you are ordering. For example if you are ordering a medium bed, please choose add recess buttons to medium bed. Our luxury dog beds and dog sofas are handcrafted in Europe by a family run business using the same high quality materials & techniques used to make bespoke furniture for clients around the world. 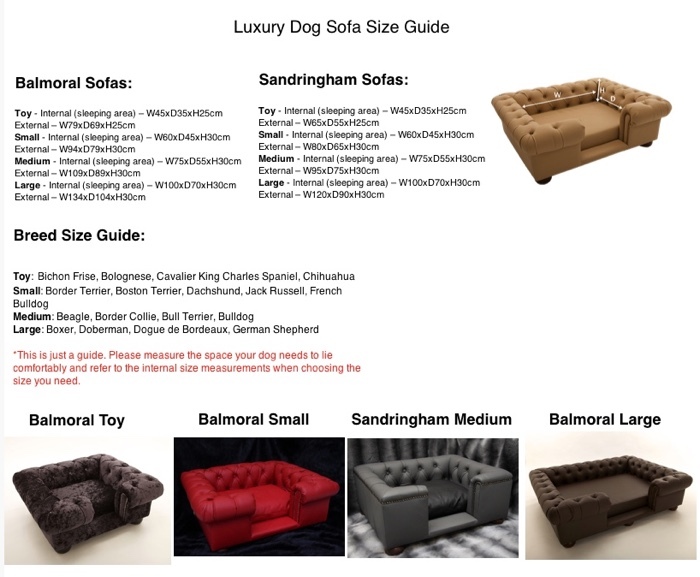 Our designer dog sofas can be fully customised in a stunning range of faux & real leather, plus crushed velvet finishes. All our fabrics are chosen with pets in mind and are hard wearing, but at the same time soft and comfortable, like your own furniture! Why splash out on a new bed every couple of years when they can have their very own sofa for life. Made by Scott's of London. If the item arrives faulty or it is not what you ordered, you will be issued a full refund or replacement. Your refund will be issued within 30 days of returning the item.